Syrian Social Nationalist Party, Arab Nationalism And Conflict In Syria 4.6 out of 5 based on 20 ratings. 20 user reviews. 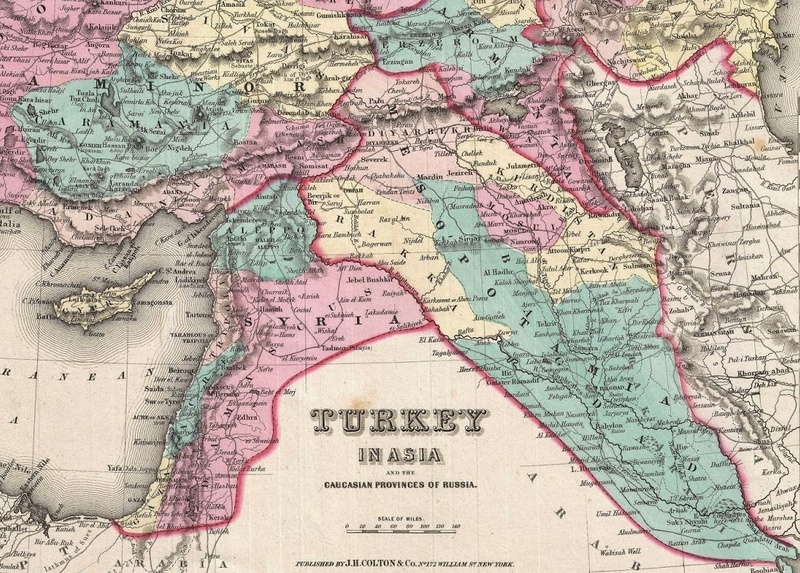 The idea of a Syrian nation within clearly defined borders is not new. In the 19t century the proponents of a Syrian state included Butrus al-Bustani, who believed that a unified Syrian nation ought to form an autonomy within the Ottoman Empire that required reform. His follower Henri Lammens, a prominent Arabist of the late 19th-early 20th centuries, claimed that Greater Syria existed already in ancient times in the Fertile Crescent. After the collapse of the Ottoman Empire, the establishment of an Arab state became a very real possibility. But the intervention by Western powers in the affairs of former vassals of the Porte and the Sykes-Picot delineation of spheres of responsibility ended plans for creating such a state. Here one needs a caveat to clarify the party’s name and its emblem. There is no similarity between it and the NSDAP. Saadeh visited Axis powers during WW2 and was arrested by French colonial authorities, but released after they couldn’t find evidence of collaboration, and Nazi leaders said they had no dealings with him. He was also in favor of French colonial authorities over Nazi rule. Another region where Eagles were active is the al-Ghab plain. This plain runs along western coastal mountains, and is in close proximity to Hama province capital. Controlling the plain creates a buffer zone which is crucial to ensure the security of coastal regions. Next to al-Ghab there are several cities with mainly Christian population, Mahardah and al-Suqaylabiya. Mahardah, in particular was the site of heavy fighting since the start of the war. Since 2015, Islamists launched attacks here nearly every day. The approaches to the city were nominally held by SAA’s 11th Division. But in the 6 years of war, the unit had practically ceased to exist. The division had under 500 soldiers and officers in March-April 2017. SSNP was able to field about 1500 fighters from among local inhabitants, and only their presence allowed the SAA to hold this important sector. It was defiantly an interesting article for which I thank you for, however after reading it all, I am left with a rather bad taste in my mouth, which I cannot quite put my finger on, maybe it sounded if I was from a Western view….I don’t know. The one thing I am confused about is, who is the “Nusur al-Zawba’a (Eagles of the Whirlwind)” in the multiple anagrams of the different factions fighting. Is it SSNP, if so, why have I never heard of them before ?……and yes, I realise it could just be down to my stupidity. Dear friend, Eagles of the Whirlwind is a military wing of SSNP. You likely know nothing about them because in general media outlets just say “the National Defense Forces” when they talk about various pro-government units. Thank you. Fully understood now, I have often wondered who the NDF were – it all makes sense. southfront, do you have to be a member/volunteer here to write your own article? No, anyone can submit an analysis/opinion piece to southfront.org via info@southfront.org However, the text has to be related to issues covered by SouthFront (military, geo-politics, security etc), fact-based and written in an analytical manner. Another question, info@southfront.org is you’re email right? I was trying to find a definition of the R+6 alliance but could not find one on the web. Could you clarify that for me please? The author makes the case that the current political systems in the region have failed and that new ideas must be presented to replace them. This in my opinion is false. The current anarchy in the region isn’t due to the failure of political structuring, rather it is due to the foreign (read Anglo-Zionist terrorist) meddling and incitement of one group again the other. If left alone the vast majority of people have no problems living peacefully along side one another regardless of differences, it is only when these differences are highly agitated by foreign powers that the peace can break down into violence and anarchy. The same groups that are fighting a genocidal war against one another were living peacefully, intermarrying, and working alongside one another in the same neighborhoods only a few years before. The post war Syria will be dominated by Assad and all forces that are closely aligned with him. The war mongering exploitation of religious and sectarian fault lines with money, weapons and political machinations by the Jew world order is the problem. If earlier efforts at Jew eradication had resulted in a Jew free planet. Much of the conflict on the planet wouldn’t exist. Outlawing their cult and getting Jews out of control positions would stop much of the war and exploitation on this planet. And result in a much healthier environment for human progress. So which country is it ? You are right about foreign meddling but then say that it has been Syrians, former neighbors, who’ve been fighting a genocidal war against each other. I don’t see the genocidal aspect but only the usual killing and destruction of any war with, of course, the al-Nusra and ISIS savagery they like so much. More to the point, I think there are more than 10,000 central Asian (Tajiks???) in Idlib alone. That is foreign interference in spades. Thousands and thousands of foreign jihadis entered Syria and made it it into everything but inter-communal violence. Thank you Southfront for this article. As an SSNP member, I can clearly see how this time and Era is perfect for SSNP to rise, Arab Nationalism couldn’t stop sectarianism, because it didn’t provide the Nationalistic feeling for the people, being an “Arab” had no criteria but speaking the language, so it had no meaning to begin with, it didn’t bond people together, and for over a century of advocating of “Arab Nationalism” and “Arab unity” it achieved nothing, and it brought division, wars, sectarianism, religious extremism, and absence of National feeling to the states of Greater Syria. But now the people are waking up, yes we might have a 100k members, but millions of Syrian have realised their Syrian identity, millions of Syrians will support SSNP when the time comes, they might not be in our Party’s membership, but when Syrians will get to choose they’ll choose a Syrian Syria rather than an “Arab” or “Islamic” or any other version of Syria. Syrian Nationalism is the cure of most our current problems, it isn’t perfect, and won’t magically turn Syria into a Utopia, but it will unite Syria, and Syrians, and that’s all what Syria needs right now. The recent chaos of the Iraqi Kurd vote and the Iraqi military moving to recover Kirkuk region oil fields. Exxon Mobil /BP thru huge coin at Northern Iraq to obtain control of this high producing region oil. The Barzanhi Kurds did crime and oil theft in concert with British/US and Israeli interest. Yet in the end,…He didn’t. ..so Empire bounced him out. Abadi was expected to do as England and America Commanded, …yet has not fully cooperated. To a place of realization that the Former Socialism with its various nuances is superior to restrictive ideology which creates walls between people’s. I’ve read that some Kurds are upset with Barzahni crime syndicate, and upset with Kurds being shoved around by Uncle Sam. I’m thinking….an awakening is occuring now concerning Socialism which could be the medium by which many people’s seek as solution and middle ground in communication, trade,and culture. Empire finds leaders from Tribe to the national/military to exploit via bribes and payoff. They want their freedom and lives back,….ability to travel and trade. As written before, You dont have advanced structures for more then Emirates. Im astonnished You insist in borderlines based on French and Britts shoud have oil from Kirkuk and also Lausanne treaty. Why do 4 countries insist in borders, which are far out. This time Syria so far is 450.000 dead and 8-10 mio. deads. And why should it now be about Kurds again as victims for the only things those 4 countries insist in. Kurds were nothing and was treated as such by ISIS first stones by Assads and next by USA. The import of Russians, Hesbollah and Iran by Assad. No change was possible even its normal for a country that it makes reform internal as well as external. Who did Kurds by SDF now attack. Well those who attacked them. And has Kurds tryed to move away Assads. So where does that come from. We hear people here say, that Syria was an old state and kurds were not. Well Syrai as any state was 1000 years ago and whome blame Jews ? At this map You actially see a Kurdistan as well as Syria in Ottomans – and before them even those with the 7 hills in Konstantinople. When I read Your 4 country as in the historybooks almost all are constructed lies. No wonder You cant commnicate – exept about the kurds being primitive barbarians, rapers and robbers from the montains. Very strange to see the Yellow Raqqa region is exact what SDF`s in an arab majority has made. Why cant it live in peace ? Why ? Seemes some many has found themselves and even have a realistic program for the future. Its a well written article, but does it give any answers to the future exept some dicatator named Assad can have the whole army as his own for the next killing of 450.000. I see 4 countries, which hardly can handle normal things.But are they real countries. To me its where people work harder because they by that support it, because it support them by progress. I sont se that. I more see warlords, where the tops are grapping for oil and use that and the people for extreme corruption and effetivity in traditions, which has been outdated long time since the last Sharia update as well. When it written again and again Israel dothos and that, are they those bad people writte all ower – Or are Your systems simply of low value. I have joked about too. Many didnt like. I asked if Jews wrote Your Choran to keep Your down obeying any hardliner father as at home – And if that wasnt enough, they also wrote Your stupid economic system too keeep You down. How comes, that big and small producers of oil not even can produce simple plastic buckets to Your local markets. You wages are very low. All is about the reel power and influence by that . You have to divide it out to all and make Your people responsible. And where the men has learned to cintrol themselves all Your women can raise the BNP even they only are in low educated areas as the men in Syria mainly are. Take a look at the map you show (and seem to think is so relevant today). NOTICE – “Kurdistan” is unquestionably NOT within the present borders of Syria! The Kurds and SDF are nothing but a cat’s paw for outside players wanting to stir the pot. At first (prior to the 20th century) the colonial western powers directly intervened in their areas of geopolitical/economic interest. After colonialism was ‘outwardly’ rejected in the 20th century, the external players needed proxies to further their interests. Israel (a 20th century arrival) being the most obvious proxy in the region. Today we have the same game being played with the accompanying talk of the formation of ‘new’ states such as ‘Kurdistan’. It is more than a little coincidental that this project is (outwardly at least) only supported by Israel. I agree about all of it exept west by britts didnt create that west of Jordan today to be a state at all. It was meant to put a western modern state into the holes of the farmland and industrialize and create jobs for it. The purpose was to protect Suez as well as the pipeline from Kirkuk and making control.You have to add Cyprus. That was why britts only had limited emmigration for it, so jews and other emmigrants should only settle as city people. That came out of hand and in after WW2 the jews in Europe and mainly from the few left in KZ again had to choises USA and “The promised land”. If You should blame any in that it was Russia,Poland, Lituania and Germany by killing and killing jews instead of usingthemas an important part by their inovative nature. In only see the Israelien support as a classic one: As long as You enemies fight against enemies, they dont fight You. You see the same at the little ISIS enclave at the Golan. They get some help, becaue they are a fighting buffer against Hesbolah as well as Assad. “protectorates” was the word for all those new countries. To me it said You should prepare them for being independent, because they had no structires for it as well as borderlines. Nothing said there should be those malfuction states of today, where only Jordan seemes to be with few problems. The real problem was, that Lausanne come through as well as kurds got double crossed by the Mosul treaty and did not get their own autonome as on the map here. You write NEW, but whats new. Irak hasnt been a state before. It was something completly different in North and a small or big Mesopotamia, so You do have a conglomate with no glue. Syria is same thing. You could have those states from Aleppo by Raqqa and east. Then they were runned like thats, those themselves and You wouldnt have the need of the upcommig contrasts. You do forget those terrible genosides by kurds came AFTER Lausanne as well as the the Mosul treaty as a RESULT of it. None got their own there, and they tryed to make space by killing the ones, they could. Thats est. 400.000 Assyrians and a mix of up to 100.000 Christians and Jews. Thats what You put under Your thick and hatefull carpet ever since. RESULT og grabbing oil, greet, envy total misunderstood nationalistic kind of madness. Balfour 1& 2 as well as Severes wasnt made for that. I do agree about the takers of Ottomans and the collapse of it has the main part of it. But I also see, You have just done like them and in a much less sensible way just replacing one big Dictatorship with some tolerance into some more with smaller respensability for all the inhabitants for it. The map could have eliminated the mainreasons for the many versions of kurdish uprice. Looking at SDF`s today, I dont see any kurdish nationalism. I see them try to eliminate by sekularism and a possibleall should decide more then ever. It also show a way out from being poor by inventing a sector, which is very productive, when its best. I stop by my local danish version. Thousends has come to Denmark telling they are muslims, but they have never written a single line in the 3 written parts, because it has been gien to them by traditions where even the local Imam cant read. They then learn to read and write in Danish and we have to translations of the Holy Choran – a “traditional” and a “modern” one. We also have a childintrdution one. Its a big chock for them, that their knowledge by parents as well as parents are so far from Islam and driven by only old mens rights. And its double. Especially women down from females not even get the rights, they got by the incommings by Muhammed. And they now live in a coutry with less crime then the parts of Muslim countries, they come from. Even we have much less restrictions but instead learn them our kind of bigger freedom also demand we are much more respensible in respect for others – and You gain respect for how Youbehave. Its not given from fx what You have beteen Your leags or Your Granfather like Your way of being a waiter for him. But thats where the country making is. A country is making each other trust each other. Its not the fear You declare here – The Kurds should be like this and that and certainly down kissing Your dirty feet obeying You self annouced greateness. What You do is actually behave like colonyowners Yourself being oilgrabbers as britts, french, americans, russians. Its about You not able to change. The article and its many nice words and ilustrations has not a single idea about a possible future, which is worth living in. None. Its repairing an old car from and old car with spareparts as copies of it self. It might drive again – It does, but improvements are going back in time. I did not understand much of what you said. However, i am glad your Kurds are being educated and seeing how much they have been lied to about Islam ,by their leaders. I agree with the author that this long and brutal war has strengthened the concept of “Syria” to many who live within its borders. What I find hopeful is President Assad has stated many times he is willing to negotiate with any group who’s interests are for all Syrians. The SSNP’s concept of what is most important to a nation, “..historic sense of community among people living in a certain area, irrespective of their language, religion, or nationality”, is a concept whose time may have arrived. Bashar Assad’s stated concepts of a new Syria and pan-Arabism seems to incorporate the SSNP’s thinking. It will be a most interesting discussion that will be held after peace comes to Syria, assuming the various opposition groups can form a coherent and viable set of concepts for the future of Syria. The author may be overstating the role and strength of SSNP. A group of 100,000 is not that significant in a country of over 20 million. Whatever happens, Bashar Assad is the person who will lead the effort for change. The article raises a lot of interesting and relevant issues. Being an American who has traveled extensively throughout all 48 states and Canada. My perspective is that borders and religion are constraints and impediments to normal life that should not be paramount, but used to the extent that they play a useful role in human development. There’s a huge difference between crossing the Canadian border and crossing state lines. Crossing state lines is effortless and has no constraints. Crossing the Canadian border is a real hassal. The ruling means that the group’s headquarters near St Petersburg and 395 local chapters will close. It will be required to hand over all its properties, known as Kingdom Halls, to the Russian government. “In the five and a half years since its founding in late 1978, the IHR had generated considerable notoriety as well as hateful hostility. In particular, the Institute’s revisionist publications on the Holocaust issue had enraged Jewish groups. Perhaps the most vehemently hostile of these was the Jewish Defense League, a militant Zionist group with a long record of violence that the US government’s FBI had identified as a terrorist organization. Between February 1981 and October 1982, the Institute’s office in Torrance as well as individual IHR employees were targets of a systematic campaign of violence and harassment that included a drive-by shooting, three arson attacks, vandalization of IHR employee-owned automobiles, slashings of 22 tires of employee automobiles, JDL-organized demonstrations outside the IHR office, and numerous telephone threats during office hours and at night to IHR employees at home. During the course of a JDL demonstration in front of the IHR office on March 19, 1981, JDL activists attacked the car of the landlord’s agent, who had arrived to ensure security. Seventeen days later, on April 5, 1981, JDL hoodlums staged another violent demonstration outside the IHR office, during which an IHR employee was thrown to the ground and beaten. In the early morning hours of June 25, 1981, came the first firebombing attack against the IHR office. Fortunately, the arson device — similar to a “Molotov cocktail” — caused only minor damage. A man claiming to represent the “Jewish Defenders” announced responsibility for the attack in phone calls to news agencies. 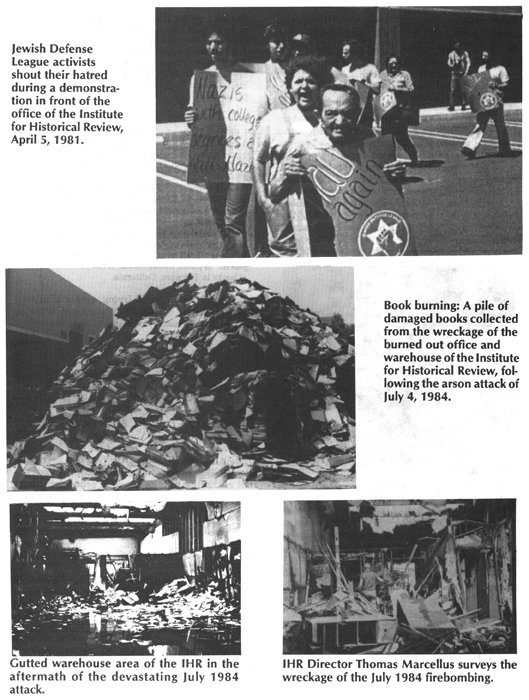 The second arson attack against the Institute office came on April 25, 1982, in which a copy machine, a few pieces of furniture and some records were damaged. In a telephone message to a local news agency, the “Jewish Defenders” again claimed responsibility. In an attack on Sept. 5, 1982, the IHR office was riddled with gunfire, demolishing two windows and damaging the front door. Additionally, a small arson device caused some slight damage to the front of the office. Later that day, as throughout the week, came a barrage of murder-threatening telephone calls. “Between December 1969 and August 1972, Kahane’s JDL — with important support and guidance from Menachem Begin’s Herut party in Israel, top officers of Israel’s Mossad secret service, and several wealthy American Jewish businessmen — carried out a campaign of criminal attacks against Soviet Russian diplomats and other Soviet targets in the USA. The goal was to focus attention on and generate sympathy for Soviet Jewry, and to damage relations between the United States and Soviet Russia. You started strong, brother, but got wobbly on the borders issue and then hit that slippery slope of the interstellar community of nations . . . . If you read the thread, than you probably learned quite a bit that you didn’t know before you read it. Try and give some thought to the comparability gap between someone living in 1017 AD, illiterate, with a double digit IQ who spends 98% of their life within a 10 mile radius and has a 35 year lifespan. And someone living in 2017 AD with a low triple digit IQ, using a computer, traveling across seas and continents in a plane, with a 75 year lifespan. And someone from off planet whose lifespan is centuries or semi immortal, travels between stars and time frames, has a mid to high triple digit IQ, and multiples of our lifespans in experience. And maybe the slope will be less slippery for you. Then put yourself in my position dealing with lifeforms from civilizations with technology far in advance of our own, and maybe you’l get a better understanding of looking at our current circumstances from someone with my perspective. And things like a technology upgrade for our planet. Extended lifespans, an end to war poverty and pollution. And closing the comparability gap with off planet races already there. Might start to make more sense. I view Jews as an obstacle to obtaining these things in a safe and peaceful manner. I don’t think that all Jews as individuals are bad people. I think that their ideology, cult and collective is a net negative for humanity that we’d be better off putting in our past to create a better future without it. This was a very helpful article on a very broad subject and I found its explanation for growth of Islamic radicalism most useful. A helpful primer for one who has despaired of seeing Muslims as capable of embracing the better aspects of liberalism, if you’ll pardon the use of that term. Not being well read in matters pertaining to the Arab world, I found it interesting to read of important rational secular currents rather than the Islamic obscurantism that seemed dominant and irresistible. I disagree that socialism has anything to offer any people. Its essence is that one man can lay claim to the labor and assets of another. It starts as an emotional appeal to soak the (super) rich, greedy capitalists, bankers, etc. but the exactions gradually expand and expand until it is productive middle class people who are paying heavy taxes. The welfare state controlled by those caring, competent, educated, saintly, non-sociopath socialist leaders never diminishes; it always expands. Free markets, entrepreneurship, and capitalist dynamism will do wonders. Syria, under Bashir Assad especially, is most impressive as a nation where Muslims seem intent on coexisting with other faiths and cultures. It’s astonishing as it contrasts with the avalanche of stories of salafist monsters shooting up concerts and exhibiting contemptible supremacism right inside the West. Syria is EXACTLY the kind of polity that the West should rush to embrace and support but tragically has instead chosen to destroy. The West us in a deep moral crisis of its own and yet we presume to instruct Syrians on who should run their government. Finally, I think Israel made a strategic error in seeking to destabilize Syria and Iraq. This seems a strategy designed to amplify hatred of Israel. This is not a formula for success. Israel will fare better by seeking to deal with big men, not small ones. There is a saying, “Never fight a small man. He will kill you.” It applies here. The middle east would be a much different and better place without Israel and Jews in the neighborhood. Syrian nazis… how disgusting. Especially disturbing are such ideas as “Jews are unable or unwilling to assimilate”. Assimilate to what? Why should anyone want or have to assimilate to anything? Do you want a Borg-society? “Jews are a mix of different ethnicities”. Of course they are, as everybody else on this planet. I can see that Jack, who posted further below uses Syriac letters to write his nameܓܐܟ So, why haven’t you assimilated and only use Arabic?